World of Beer is a fun new drinking spot in the Walden Galleria. Steve Jensen, left, Tim Cramer, Tim Pickering and Brian Chapin get in the spirit of the season. 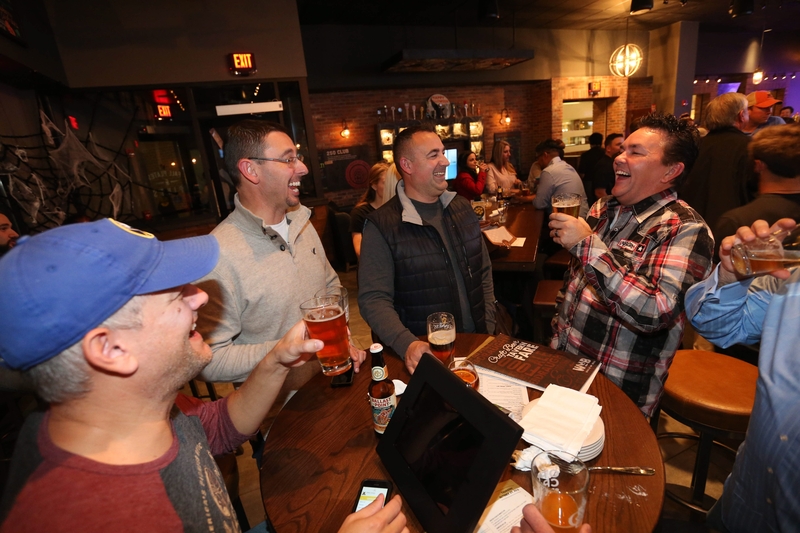 With much anticipation, the newest beacon for beer drinkers – World of Beer – opened in late August in the former Ruby Tuesday location in the Walden Galleria. We predict this Florida-based bar franchise will be a hot hangout this holiday season, especially by those dragged to the mall against their will to shop or carry packages. Who couldn’t use a cold one following such a traumatic event? Off the beaten path in a corridor near Macy’s on the Millennium Hotel side, the tavern features a mind-blowing 500-plus bottles of beers along with 53 drafts (or “draughts” as they’re called) all crammed into an area that looks like a nightmare for bartenders. With taps and bottle coolers spanning the length of the bar, workers cross paths with fellow tenders throughout the shift. Seasoned beer drinkers will love that they can home in on a specific selection, while the rest of us who might not know what we want have a little work. Taps rotate daily with “hot off the press” lists printed frequently. Descriptions read like a wine list. “Light & Crisp,” “Wheat-Weiss-Wit,” “Hop Forward,” “Malt Forward,” “Dark & Bold,” “Belgian & Belgian Influenced.” Patrons can sample any beer and flights are available. Items in the Mixed & Draughts pack an extra punch. The Black Velvet involves a stout floated on top of apple cider. The Clueless combines cider and American wheat ale with a splash of Framboise, a raspberry liqueur. Bottles are more complicated. Unless you know what you want, we recommend using the funky digital menu. Drill down in categories including kind, draught, bottle, country, style, ABV. Bring your readers, if needed, for the hard-to-read screen. Or simply consult with a bartender. Avoid sticker shock by looking at prices. We learned one bottle hovers around $35. Don’t ask how we know this. Non-beer drinkers need not hide their distaste of suds either. WOB notes, “We love beer, but we also have great respect for all well-crafted libations.” Specialty cocktails, spirits, wines and sangrias are readily available. Nothing smooths out shopper’s shock like a Maple Manhattan made with Maker’s Mark bourbon. WOB pays attention to food, too, or rather what goes well with beer. “Tavern Shares” (think Street Tacos, WOB wings) burgers, sandwiches, flatbreads and salads are listed with suggested beer pairings. Even the Belgian Waffle S’mores come with a suggestion – stout. But perhaps our favorite choice is the humongous German pretzel that arrives on its own hook. Dark and crispy outside, warm and soft inside, the pretzel comes with mustard but we recommend adding melted beer cheese. Because if there is one thing better than beer, it’s beer cheese. Hours: 11 a.m. to midnight Monday through Wednesday and Sunday; 11 a.m. to 2 a.m. Thursday through Saturday. Happy Hour: 3 to 7 p.m. Monday through Friday with $4 select draughts, $5 Tavern Shares and $6 cocktails and wine. Scene: Busy beer bash with a lively crowd and backdrop of fun music. Tables positioned in the mall corridor provide a quieter experience. Daily Special: Sunday BEERunch features beer, breakfast and lunch food from 11 a.m. to 3 p.m.
Just tapped: Visit website for complete beer list and notices about what’s just been tapped. Beer events: Tap takeovers, beer dinners, loyalty parties. Fashion note: Ugly Holiday Sweater Party and Beer Tasting on Dec. 10 with prizes. Extra: Entrances inside or outside of mall. Televisions tuned to sports. Fire pit outdoors with seating. Wednesday night trivia. Live music Thursdays, Fridays and Saturdays.